All but one of our rooms face the emerald waters and the seashell covered white sands. Watch the fishing boats head out in the mornings and pelicans dive for breakfast out of mid-air. Every so often one of the resident hummingbirds comes up close to say hello and with some luck you'll see horses strolling along the beach or dolphins swim past. With this scenery, kicking back and soaking in the calm becomes a natural extension of sipping your morning coffee. We designed our rooms with a refreshingly modern feel, choosing a mix of selected and custom pieces of original arts & crafts. We played with colors and cultural influences while still working within our passion for contemporary design. We equipped all rooms with air-conditioning and ceiling fan, mosquito screens and hot water, included a coffee-maker and a small fridge as well as an in-room safe. A traditional hammock, found in almost every Yucatecan home is also included to enjoy. If you don’t want to brew yourself, we serve fresh coffee and tea downstairs in our breezeway every morning. Free WIFI (even though at “Celestun speed’") and on-site secured parking is available as well. Our rooms on the ground floor are 22-m² (230-feet²) in size and have a large personal terrace to hang out on. Two of these rooms face the ocean and are only steps away from the beach access. The one & only courtyard room on the other hand, overlooks the serene landscaping with its tropical plants and our social fire place. It also allows quick access to the pool for a dip. The Bathrooms feature a walk-in shower and have separate sink area. 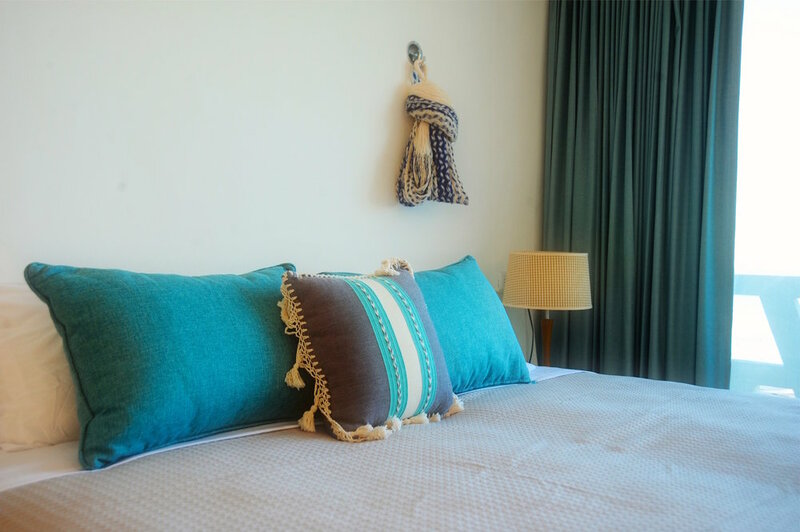 All the rooms on the upper floors open to their own private balcony with a view of the Gulf. They are 38-m² (400-feet²) in size and offer a choice between 2 singles or 1 king-size bed (please let us know which one you prefer at the time of booking). The bathrooms feature a walk-in shower with an open-concept sink area facing the main living space. click here to make your booking request now. PLEASE NOTE: Nightly rates are automatically DISCOUNTED when making reservations for 2 nights or more. All rates are listed in US-Dollars and include 16% IVA & 3% tourism tax. All rooms are strictly NON-SMOKING (including the balconies) and we cannot safely accommodate children under the age of 12. Before booking please familiarize yourself with all our Terms & Conditions. For group-bookings such as weddings or workshops please contact us directly.